We are St. Stephens Indian School, and our students and campus are the pulse of this community. As educators and community members, we work together to create an environment that promotes a desire to learn and succeed. See how we do it here. All students will be provided a safe, success-oriented, culturally responsive educational environment, which will develop responsible, respectful, productive, and well-adjusted individuals in an ever-changing world. 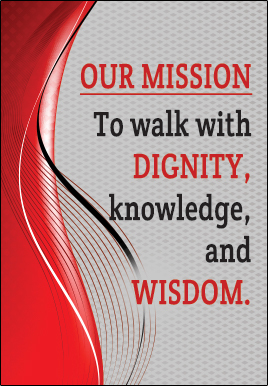 We believe that St. Stephens Indian School exists first and foremost for teaching and learning. Our students will be taught the techniques for living and leadership in modern society within a curriculum framework, which includes the art, language, and beliefs of American Indian culture and heritage. We believe that all students can learn when provided with a positive, success oriented, and safe environment. Students, teachers, administrators, parents, and community are equally important in the learning process.